Do You Know What Decides Your Car Insurance Premium? Have you been paying the right premium for your car? 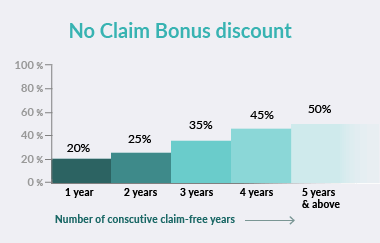 Read on to know exactly how your premium gets calculated. So, you have purchased car insurance because it is mandatory. Or you are one of the smart folks who love your car and know that a good insurance is the best way to protect it. In either case, don’t you wish to know the secret sauce, which insurance companies use to come up with a figure? Or how with those secret ingredients they calculate your Car Insurance premium? Let’s unwrap the mystery – one fold at a time. 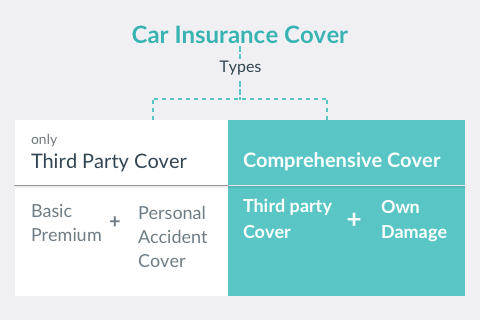 Third Party Cover (TP): The third party insurance covers damages triggered by your vehicle in the event of an accident. It is mandatory, as per the Motor Vehicles Act (1988). The basic premium for TP cover depends on the Engine capacity or cubic capacity of the car. The more the cubic capacity, the higher is the premium. 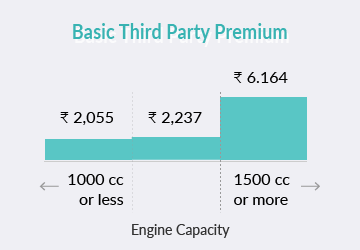 While the total premium paid is the sum of basic premium and the amount for personal accident cover for owner/driver*. *Personal Accident cover – Under personal accident cover, you (or your nominee) will get compensation of up to Rs. 2,00,000 in case of death or disability of owner/driver. Also, for any car this cover is offered at Rs. 100. It is major component of comprehensive cover. It depends on the own damage factor and the Insured Declared Value (IDV). Own Damage Factor - The own damage factor is a standard factor decided by Motor tariff. It depends on the engine capacity of the car, the location of the RTO registration and age of the vehicle. Insured Declared Value (IDV) of the car – Your insurer decides IDV based on the ex-showroom price and percentage depreciation. In case of theft or if the car gets completely damaged, you will get back the money equal to the IDV you declared while buying the policy. The older the car, the lesser is this value, and thus the premium. 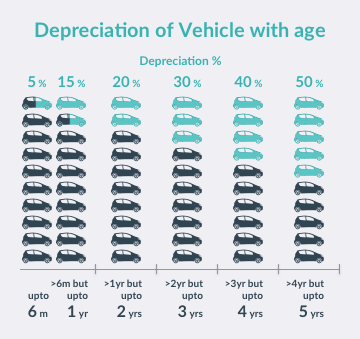 The percentage depreciation value depends on the age of the car. Insurers’ discount : insurers’ discount varies with insurers. Thus, comparing and buying is always recommended. When you buy insurance from portals like Coverfox.com, you can compare the quotes and avail such discounts. Coverfox helps you find the best deal at the best price by helping you compare offers from all the top insurance companies. You can choose and buy the policy almost instantly. Most importantly, you will be hand held through the tedious claims process. Compare Car Insurance Policies Online! D) Additional covers Any extra covers that you buy by paying more premium will be an additional cover. Different insurers offer different additional covers like personal accident cover for passengers; cover for electrical and non-electrical accessories; an add-on cover like zero depreciation cover, engine protect cover; etc. You can buy more than one additional cover for your car. Depending on the number of these coverages you opt for, the premium would increase. 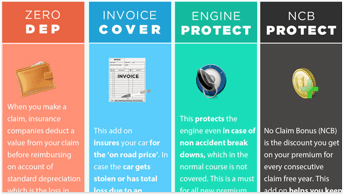 This infographic has a list of recommended add-on covers and their impact on the premium. How to save money on car insurance policy with motor addons? How Is the Car Insurance Premium Calculated? * For personal accident cover a standard amount of Rs. 100 for is charged for all cars. ** Service Tax – For any cover, a standard percentage of service tax is applicable. It is a common component for both the covers (TP and comprehensive). That's it! Now you know how Car Insurance premium gets calculated. If you got all that – you have earned yourself a cookie. You can check out the premium amount for your car here. If you haven’t, don't worry – you can always bookmark this article and get back to it later. If you have any other questions you can leave them in the comments. If you need help in finding the best policy for yourself, you can schedule a call back below, and we’ll get back to you ASAP.